The LibreLinkUp app is now available on iPhone in the US, bringing the benefits of remote monitoring to US FreeStyle Libre users. 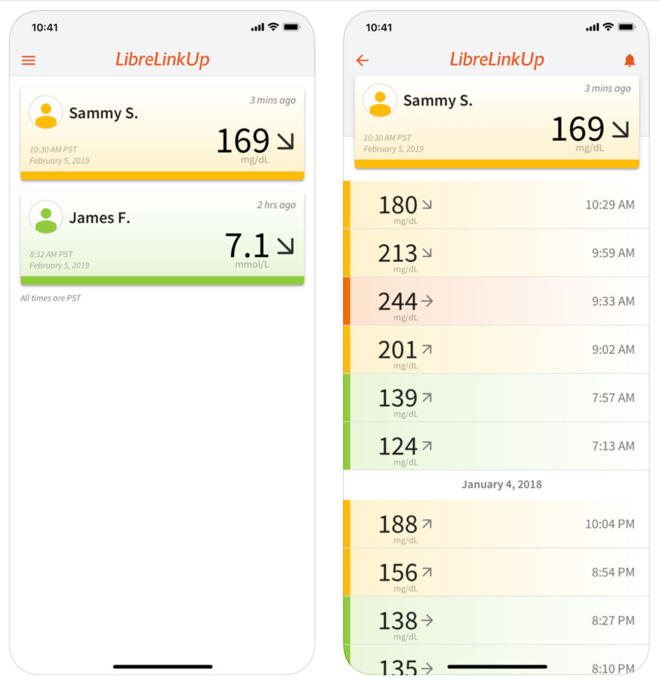 LibreLinkUp works like the version in Europe: the person with diabetes scans a FreeStyle Libre sensor with their own FreeStyle LibreLink iPhone app, allowing the caregiver to remotely view the current glucose and trend within LibreLinkUp. Similar to Dexcom Share, a user must invite a loved one to follow their glucose levels. But unlike Dexcom Share, LibreLinkUp does not allow caregivers to see the glucose graph – only the current value and trend (like a logbook of recent scans). Neither FreeStyle Libre app is available on Android in the US, though we have to imagine those are a big priority. LibreLinkUp is a key launch for Abbott, given the obvious remote monitoring needs in Medicare and pediatrics. We assume the pediatric indication for FreeStyle Libre is still under FDA review, which would bring FreeStyle Libre’s age indication from 18+ years to 4+ years in the US. Submission occurred at least six months ago – is approval close? We would imagine so but it’s always hard to speculate. We are also awaiting FDA approval of FreeStyle Libre 2 (with optional high/low alarms via Bluetooth), which was expected in the US “shortly” as of January’s call. It will be interesting to see if Abbott submits for iCGM labeling and how it markets both products in the US. FreeStyle LibreLink still does not post to Apple Health, though we hope to see that in the future – it would be an easy way to share data with other apps without needing a formal partnership. FreeStyle LibreLink and Dexcom G6 are pretty much neck-and-neck in popularity in the US Apple app store: #69 and #43 in the Medical category, respectively. (We’re not sure how Apple calculates “rankings” – new downloads? Updates to the existing app?) FreeStyle LibreLink remains well ahead of G6 on app store ratings: 4.2/5 stars (n=283) vs. 2.8/5 stars for G6 (n=593). We wonder how much of this relates to communication reliability (NFC vs. Bluetooth) across different phones and situations vs. alarm interruptions/sounds vs. other features. In testing FreeStyle LibreLink, we did love that retrospective CGM data was built right into the app , rather than in a separate app like Dexcom G6 and Clarity Mobile. Dexcom recently added a quick shortcut to get to Clarity Mobile, but it’s still a separate app. As we understand it, separating the real-time and retrospective CGM data was originally for regulatory reasons, but perhaps this makes less sense in the iCGM class II world. Will we ever see Clarity-like stats in the G6 app? Kelly’s experience with the app (n=1) was that it’s slightly harder to scan with the app versus the Libre reader but the statistics are excellent! Since the reader is so small, it’s easy to still use it, but the stats are invaluable. It is necessary to use an Apple 7 phone or more recent model for FreeStyle LibreLink.